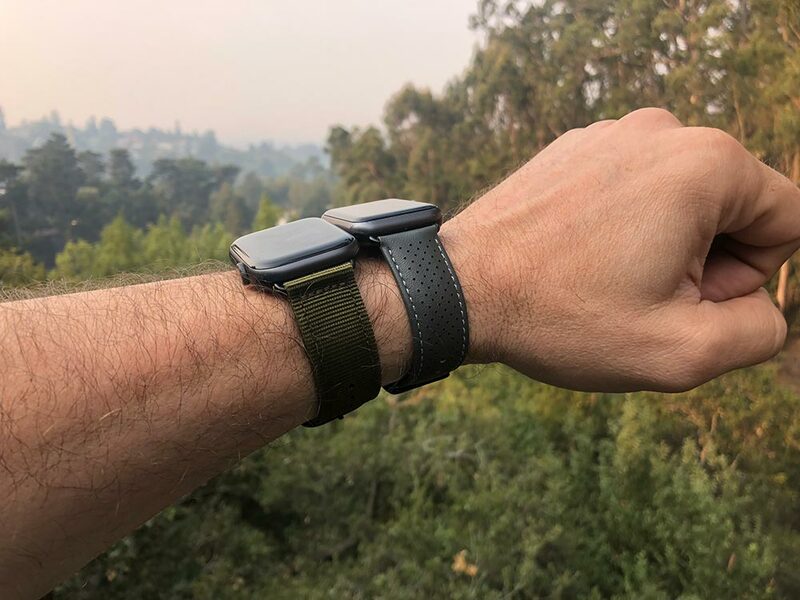 REVIEW – The Apple Watch is clearly a success and multiple generations later, an easy device to spot on the wrists of strangers and acquaintances alike. Thanks to the interchangeable band interface, they are very easy to swap out for a new look. If you’re looking to customize your watch, or maybe someone else’s (holidays are close at hand after all), Monowear has some great options to make a watch a little more unique. I recently received two of their bands to review, so it’s time (watch pun) to look closer. 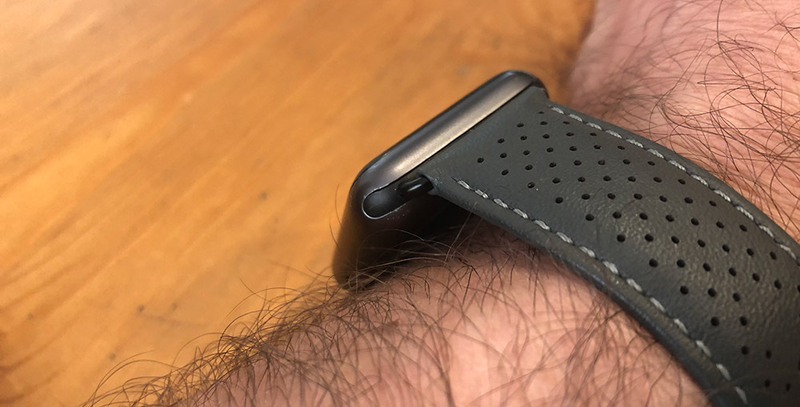 The Nylon Band and Perforated Leather Band are two of eight different bands that Monowear currently has available for the Apple Watch. I chose these two specifically as options that visually strayed a little further away from stock bands. Each box has just the watch band as it’s all you really need. I chose the Olive Nylon and Grey Perforated Leather bands. The Nylon Band is a double layer of… wait for it… nylon. Out of the box, it’s already nice and flexible. 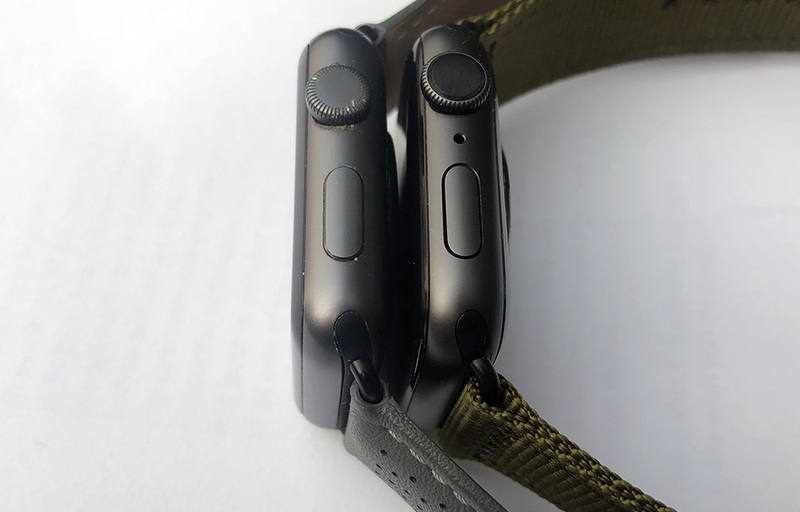 The design visually follows the traditional NATO/G10 look of the buckle and two additional rings from the outside, but without the nylon layer under the watch, as it would prevent any of the sensors from working. A tonal stitch around the perimeter keeps it all together. The nylon has a soft surface finish with plenty of support to prevent stretching while allowing it to wrap around your wrist easily. The Perforated Leather Band is as it sounds. The top surface is leather with small perforations that are purely for aesthetics as the leather on the inside does not have the corresponding holes if the intent was for breathability. That inner layer is medium camel color on all four color options. Other notable design elements are a small amount of padding used between the layers to give the band some substance and a contrast stitch around the perimeter. The first band keeper is sandwiched into the construction whereas the second is free floating to handle larger overlaps when worn on smaller wrists. 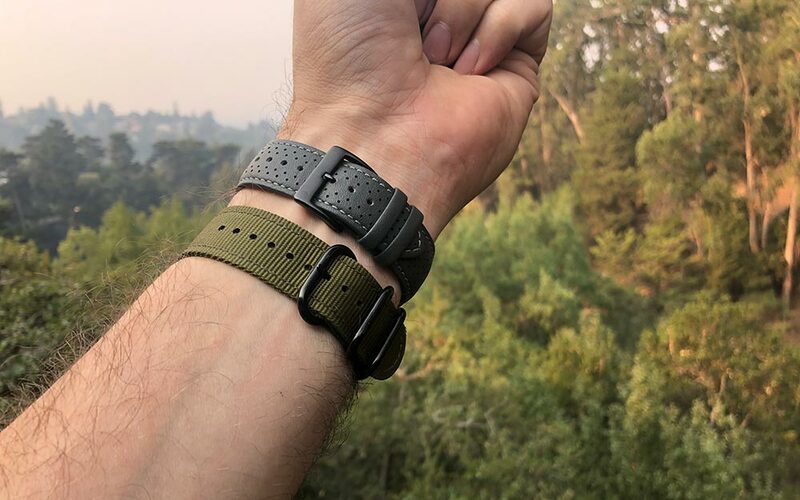 If you’re interested in either of these bands (or other Monowear bands), their site allows you to choose your watch color so you can see exactly how your watch will look with each band color. Here’s a look at Burgundy Perforated band on the different watch body colors. Installing either band involves following the process any Apple Watch owner should be familiar with at this point. 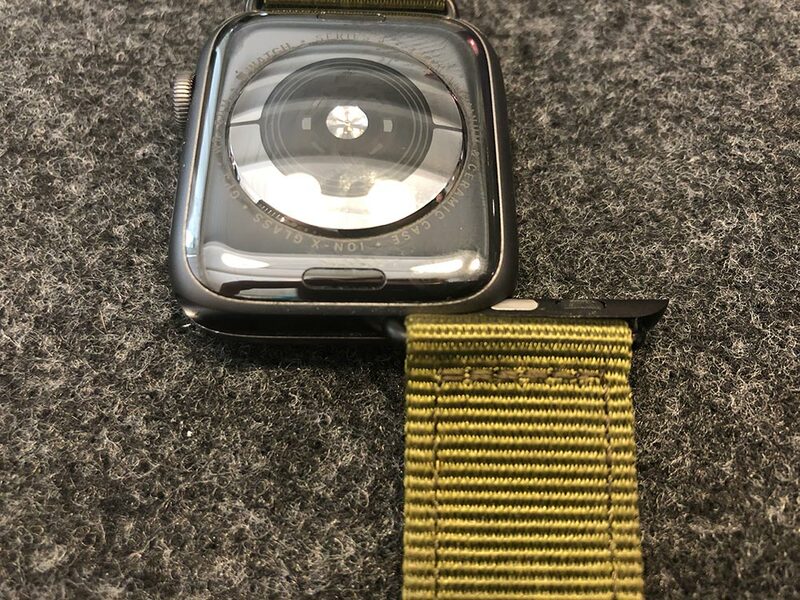 On the underside of the watch, press the small, flush oval button with your thumbnail and while holding the button down, slide the installed band to either side. To install the new band align the adapter with the slot and slide into place. I prefer to have the digital crown of my watch face away from my wrist as it’s more comfortable for me and I can then use my thumb for the button and scroll functions. Both bands have worked great throughout this review period. As you can see from the initial photos, I was still running my original launch watch (Series 0) when I received the bands. I’ve since upgraded to the Series 4 and the bands fit just as well. Both of these bands use traditional buckles which I favor. It provides a secure and repeatably sized fit. Speaking of sizing, the bands come in one size fits most. I use the 4th hole on the Nylon and the 3rd hole on the Leather band. The only fit annoyance I’ve encountered is the second keeper loop on the Leather band sliding out of place during wear. How have they fared over the month I’ve been using them? Pretty darn well. There’s almost no visible wear on either of them save for the inside of the Leather band. The lighter camel color makes it hard to avoid water and sweat stains. This is definitely not unexpected and is one of the consistencies of light leathers. The last detail I want to mention has to do with the adapter that fits into the watch. The fit is perfect and easy to install and remove. When it comes to ‘Space Grey’ however, I take issue. 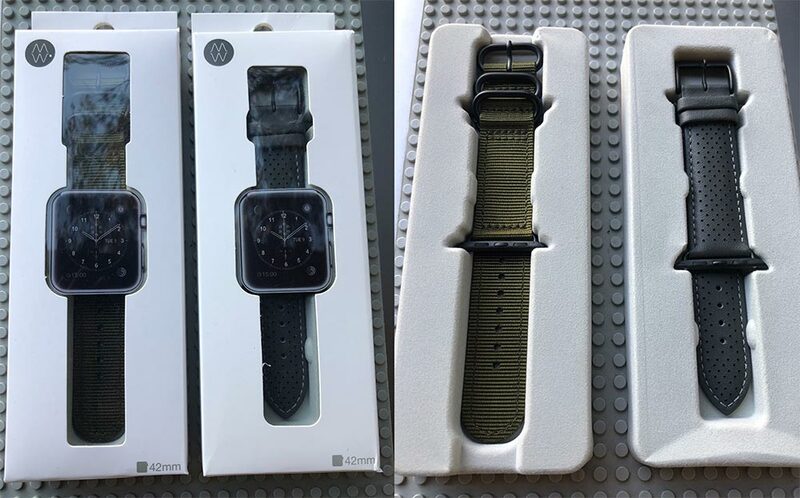 Here’s a pic of the Gen 0 and Gen 4 watches side by side. Color is very subjective and Apple’s Space Grey has shifted a bit over the years as the most recent Space Grey has a bit more red in it. When you look at Monowear’s ‘Space Grey’, it’s hard to see anything but black. Again, the fit is great, but be aware that this specific color of the adapter will not match your Space Grey watch. Monowear has done a great job with both of the bands here. I have bought a number of ‘bargain’ watch bands for my Apple watch and many of them failed quickly. That is definitely not the case here and I would venture a guess that Monowear’s other bands have similar build quality making any of them a great buy given their affordable prices.